Special limb info: Two wings. 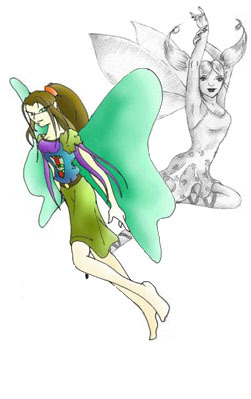 Genetic traits: Faeries are highly intelligent and wise beings that thrive upon their use of magic and their ability to move with nearly unparalelled ease. Other races consider them quite handsome and beautiful, but they are easily struck down when hit and have below average strength. Physical description: In some lore, faeries are the wee people. In others they are sprites or evil pixies. But in fact, they are all of the above. Short and thin, they look like the handsomest of humanoids with small wings growing on their backs. Faeries have pointed ears hidden behind long, dark hair. Their skin colour varies depending on where they are from, ranging from a light green, to olive, to light brown. There is one particular group of faeries believed to have some hobbit in them with pale, pale skin in burning red hair.